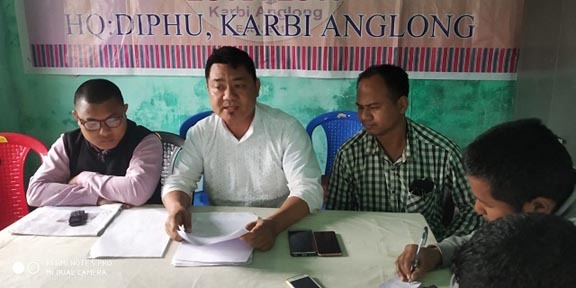 People’s Party (PP) of Karbi Anglong has levelled charges of fund misappropriation against the Water Resources department of Karbi Anglong as payments have been made to the contractors before completion of the works. Addressing a press conference at the District Press Club of Karbi Anglong, PP president Rajen Timung said under the 2018-19 Annual Action Plan (AAP) of the Karbi Anglong Autonomous Council (KAAC), the Water Resources department has taken up river embankment schemes. “But the payments for the works have already been cleared to the contractors although only 25 to 30 per cent of the works have been completed,” said Timung. Timung pointed out that there is involvement of the Sub-Divisional Officer (SDO) and Sectional Officers (SO) in this misappropriation of funds. “There is misappropriation of funds where there is the matter of protection of the Serlongri area from erosion by Diphu river. The amount of payment made is Rs 49 lakh and the contractors are Rupsing Timung and Athik Tisso. They have completed only 30 per cent of the work. But the surprising part is that before the completion of the work, the SDO and SO have made payment against the work,” claimed Timung. “Same is the case with the scheme of protection of Men Rongphar village from erosion by Jamuna river where ` Rs 54 lakh payment was made for construction of embankment whereas only 30 per cent of the work was completed,” said Timung. Timung also said an amount of Rs 4.91 crore was spent for construction of the embankment along Jamuna river. A total of 24 contractors were awarded the work. Here also only 20 per cent works were completed, but it has been learnt that the bills have already been cleared. “Surely, the involvement of SDOs and SOs is there. They only prepare bills and make payments to contractors. We give three days’ time to complete the works. The engineers should direct the SDOs and SOs to complete the works. We also appeal to the executive member, KAAC, Water Resources, Amarsing Tisso to direct the engineers to resume the works for completion,” Timung urged. While showing documents regarding the detail amount against the projects, Timung said an amount of Rs 30 lakh was spent on payment of liabilities, newspapers, etc. Some of the names of the contractors, who allegedly took payment without completing the works are Vikram Ronghang (Rs 2.9 crore), Langtuk Hanse (Rs10 lakhs), Babu Ronghang (Rs 60 lakh), Lily Hansepi (Rs 30 lakh), Chanda Bahadur Chetri (Rs 28.27 lakh) and the amounts ranges from Rs 1 lakh to tens of lakhs. The list of contractors, who allegedly took payment without completion of work has 77 names.